Here is a sampling of pictures I took during the summit. This first photo is from Wednesday night’s dinner. Roughly 35% of the seats at my table were filled by a Scott. 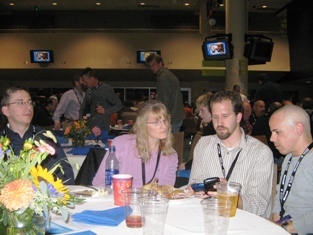 In this photo, Scott Hanselman is comparing mobile devices as Scott Bellware and Milan Negovan look on. Scott H does a great Jimmy Stewart. Also at the table was Bill Vaughn. Bill and I suspect we are long lost cousins – we both descend from Allen families of the Shenandoah Valley. 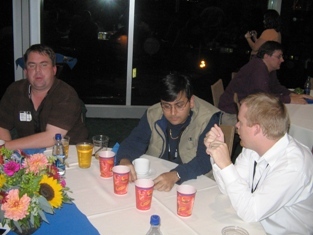 Here is a shot of Bill Ryan, Sahil Malik, and Jonathan Cogley. Sahil is presenting at the local user group this Tuesday – come on out and ask him why he prefers a Motel 6 to the W. Whatever, Sahil. 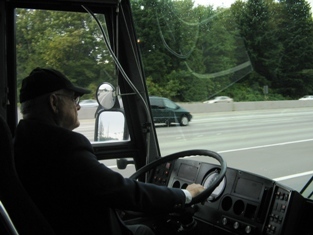 This is a picture of my favorite bus driver: Ted. Ted is what I call an optimistic driver. When Ted would see cars stopped 100 feet ahead on the freeway, Ted wouldn’t slow down a bit. Ted believed the cars would be moving again by the time we arrived at their bumper. We often decelerated from cruising speed to a dead stop in 3 milliseconds. In spite of passengers screaming “Ouch, my spleen!”, Ted remained very optimistic. I have pictures of G. Andrew Duthie on a Karaoke stage, but Paul Glavich has done one better and posted video. We need a Karaoke machine at the next code camp. This last photo is Darrell Norton at the airport. 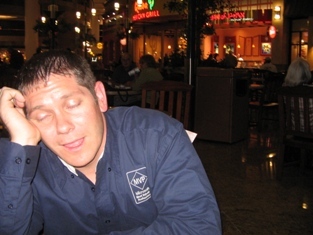 Darrell, in true agile form, was demonstrating user stories in preparation for project “Getting Some Sleep On A Redeye Flight”. Man that Darrell's photo is a classic. :). And I am witness, he worked quite hard on that project too. I could never quite figure out that K of yours. What does it stand for anyway? The K stands for Kenneth! I'm really glad you enjoyed that article.